The DynamicArm features AXON Bus technology that delivers virtually instantaneous responsiveness to the user. The DynamicArm also offers integrated Automated Forearm Balance(AFB). AFB stores energy when the arm is extended and reuses it for flexion. This translates to a smooth, natural swing during walking. In addition to the heavy lifting ability, the DynamicArm features a 50 lb (22 kg) static holding capacity. Twice as fast as other electric elbow replacements—only .5 seconds from extension to full flexion. Dynamic. The stepless Vario Drive offers optimal gear transmission for every load and provides a continuous, infinitely variable transmission of power from the motor, making the DynamicArm especially fast and smooth. Powerful. Vario Drive is proportional in speed and adapts to different loads, actively lifting up to 13 lbs (6 kg). The elbow also has a static holding capacity of 50 lbs (22 kg), and will slip if the weight limit is exceeded—without damaging the elbow. Incredibly responsive. AXON Bus technology integrates all the electromechanical components (sensors, actuators, setting devices) and transmits signals almost instantaneously to them. Natural and efficient. The AFB unit takes advantage of the energy that is stored when the arm is extended and reuses it for flexion, giving the elbow a smooth, natural swing during walking. Unlocks under load. The DynamicArm unlocks easily even when under load, and can be positioned without having to send an unlock signal, allowing the user to make less compensatory movements while providing a more natural appearance. 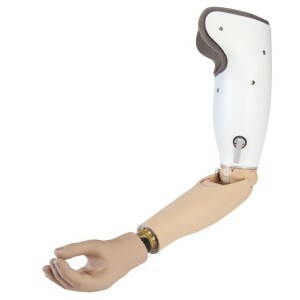 Bluetooth technology allows for programming and training of the prosthesis without the need for cords or cables. Reliable. Lithium Ion battery delivers reliable, high performance.